Edited by Don Ball. 2014, 90 pages, National Endowment for the Arts, Washington, D.C.
What translation can do for us, and what we so desperately need at this juncture in human history, is to radically increase our empathic capacities; to learn, or perhaps relearn, how to listen. I will wager a guess that most people do not give much thought to translators or to the art of translation, even those of us who consider ourselves steadfast readers and advocates for the arts in the broadest sense. Literary translation is not the first thing to come to mind when we summon the defining priorities of the current creative era: collaboration, diversity, sustainability, innovation, creative placemaking. Yet it is hard to imagine a more collaborative art form than translation, or one more committed to diversity and sustainability, or one more dependent upon innovation as a necessity, or one that provides us with a clearer sense of community. (An indigenous language is one that originated in a specific place.) In our digital age, we might think that translation must be an automated process by now, that human translators must no longer be necessary: surely Google Translate will do the trick, right? (“Isn’t there an app for that?” someone asked me recently.) That there are diligent and ingenious individuals who transform great literature from other languages into English is an almost quaint notion, but translators do not simply translate words. They are not stenographers. They are not the equivalent of analog apps. Translators alchemize foreign masterworks by harnessing the potential of the English language. They distill the atmosphere and sensibility of new and unfamiliar voices, many of which provide vital perspectives on our ever-changing world. Literary translation helps us know ourselves and each other better. In other words (in other words), to translate is to empathize, to read a translation is to empathize. 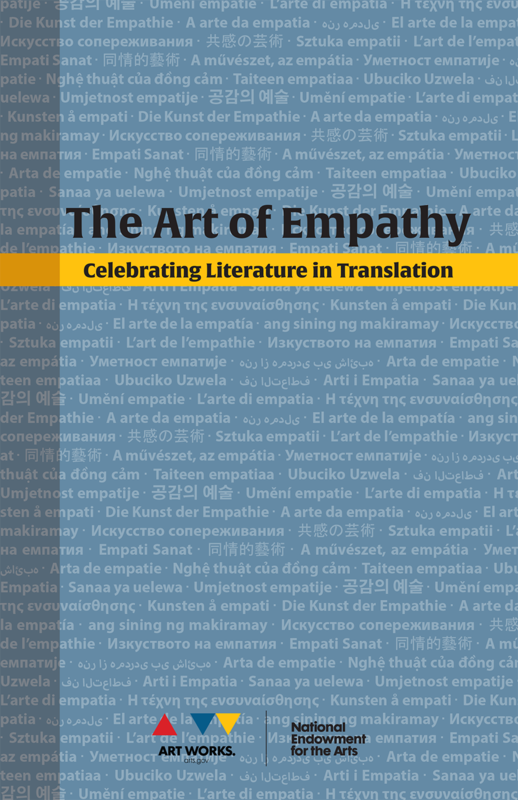 “Translation is an art,” writes National Endowment for the Arts’ Director of Literature Amy Stolls in her introduction to The Art of Empathy: Celebrating Literature in Translation. “It takes a great deal of creativity and patience to do it well, not to mention a deep knowledge of a writer’s language, place, and oeuvre. But it also takes fortitude, for translators are notoriously underpaid and underappreciated, their names often left off the covers of the books they create.” Among the many pleasures of The Art of Empathy, the NEA’s 2014 publication on literary translation, is seeing the names of so many luminaries collected together in one place: Esther Allen, Susan Harris, Pierre Joris, John O’Brien, Chad Post, Rainer Schulte, Russell Scott Valentino, and Natasha Wimmer, among many others. You may be forgiven for not knowing the translators, publishers, and educators featured in this slim volume, but to these women and men we owe a debt of gratitude. Together they make a tremendous roster of young and old, new and established, critical and enthusiastic translation practi-tioners and appreciators. What better company to describe what it means to be a translator and to outline the state of contemporary translation? “What is the closest reading you can give a poem? Translation, of course.” So writes Pierre Joris, the masterful translator of Paul Celan. “Translation made me discover not only the depth of the poem and the difficulties of the original language but also the complexities, difficulties, limits, and resources of the so-called ‘target’ language, the one you translate into.” Natasha Wimmer, who rendered Roberto Bolaño’s spectacular 2666 and The Savage Detectives in English, echoes this sentiment: “Translation is a kind of writing, of course, but it’s also a kind of reading: a very, very slow kind of reading — possibly the slowest kind of reading in the world.” Edward Gauvin explodes the notion of faithfulness in translation: “Discussions of fidelity bore me… What might at first seem like abdication or evasion can in fact be renewal, since changing the basic terms opens fertile new fields for debate. Fidelity must be neither literal nor figurative, but dynamic — transfigurative.” The Art of Empathy captures many such enriching viewpoints on an illusive and often invisible art. One shadow (or light, as it may be) that hangs over The Art of Empathy is that of the late Michael Henry Heim, perhaps the most renowned translator in the world. Heim left a legacy of some “60 books or plays, translated, co-edited, or co-authored between 1972 and 2012,” according to Esther Allen in her essay “The Sharable Rightness of Meaning” (a play on Heim’s inventive coinage The Unbearable Lightness of Being, the title he gave to his translation of Milan Kundera’s famous book). In addition to his “unconditional, unflagging devotion to the art,” Heim anonymously donated $734,000 to establish the PEN Translation Fund, which has supported more than a hundred translation projects to date. It is inspiring that Heim, translator exemplar, not only dedicated his life to the works of writers other than himself but to the writers, translators, and readers of the future. The NEA should be commended for considering literature in translation a subject worthy of exploring in The Art of Empathy — and for its longtime commitment to translators and organizations publishing translation (including my own). The agency has awarded more than $8 million in grants since 1981, a significant investment in literary translation indeed. The title The Art of Empathy is telling. Despite our radical connectedness, there is seemingly everywhere a yawning divide between people. Whether we consider the protests in and beyond Ferguson, Missouri, or our shockingly partisan political system, or the pervasiveness of technology in our lives, we would all benefit from cultivating a greater sense of empathy for the people with whom we share this planet. Many of us are called to the arts for this very reason: we want to connect with people. As Susan Harris, the editorial director of the Words without Borders website, writes: “literature, with its crucial insight into world events from a human perspective, provides an incomparable link to culture from within, and is ever more valuable in establishing context and filling the lacunae in news reports.” We need to hear world voices now more than ever. Michael Holtmann is the executive director of San Francisco’s Center for the Art of Translation. The Center’s president and founder, Olivia Sears, is featured in The Art of Empathy, and the Center is a frequent recipient of NEA funding.